WASHINGTON — During an interview on Friday hosted at George Washington University and moderated by NPR’s Nina Totenberg, Supreme Court Justice Ruth Bader Ginsberg admitting falling asleep during this year’s State of the Union address, stating that she had been drinking that night. “The audience for the most part is awake because they are bobbing up and down and we sit there, stone-faced, sober judges,” she said told those gathered for the event, which included Justice Antonin Scalia. “But we’re not—at least I was not—100 percent sober,” Ginsberg, 81, admitted, being met with applause and laughter. She said that her lack of sobriety was due to the wine that Justice Anthony Kennedy had brought to the meal the high court justices shared together that night. The intoxicated justice then fell asleep, slumping over during Barack Obama’s State of the Union address. She said that it was not the first time she had dozed off during such speeches. 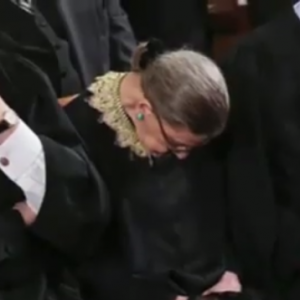 Ginsberg told the university audience that it was Justice Kennedy’s and Justice Stephen Breyer’s responsibility to keep her awake during the event, but apparently did not, as they are “sort of timid about that.” She stated that now-retired Justice David Souter used to nudge her in years past if he sensed she was nodding off. The Clinton nominee outlined that she didn’t realize what had happened until later when she returned home. “So I got a call when I came home from one of my granddaughters and she said, ‘Bubbie, you were sleeping at the State of the Union! '” Ginsberg told the audience. According to the Washington Post, in 2013, Ginsberg stated that a “very good California wine that Tony Kennedy brought” was the reason why she dozed off during the 2012 State of the Union address. Ginsberg has been known to be one of the more liberal judges on the bench, consistently ruling in favor of abortion and homosexuality. As previously reported, she wrote a scathing dissent in the Hobby Lobby ruling last June, bemoaning how women would be obligated to pay out of pocket for contraceptives and abortifacients instead of their employers.